On the west coast we are used to living with rain – and lots of it. So why do homeowners face lawn sprinkling regulations from June to September? The answer lies in our region’s ability to store water. Plants, flowers and vegetables love rainwater from a rain barrel. 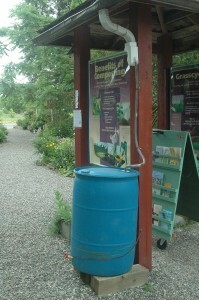 Rain barrels can collect rainwater from your roof year round and store it for when you need it the most. Rainwater costs nothing and is chlorine-free, which is great for plants. By placing a down-spout diverter directly into your roof’s gutter system then to your rain barrel, you’ll have a rain barrel full of rain water in no time. Visit your local hardware store or build your own less expensive version. Notice the direction water flows once it reaches the ground. The contours of the land can be changed to catch the rainwater and speed or slow its flow in order to hold it in the ground for use by plants. Alternatively,one can plant according to pre-existing contours, using low areas for water-hungry plants and slopes or high points for drought-tolerant plants. Adding compost or decomposed organic matter helps soil hold water, improves drainage and adds nutrients needed for plant growth. Mulches applied and maintained at appropriate depths in planting beds will prevent the soil from overheating and drying out. Mulches will reduce weed growth and prevent erosion. Mulch can also be used where conditions are not adequate or conducive for growing quality turf or ground covers. Mulches are typically wood or bark chips, leaves, straw, nut shells, or small gravel. Select plants based on their ability to adapt to the landscape. Many plants have a place in a Water Wise garden, but native plants are the best. 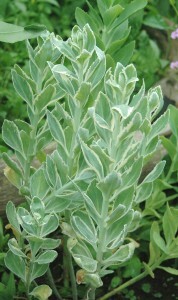 These plants are naturally rain-watered and are adapted to wet winter and dry summer conditions. Plant only natives that have been grown in a nursery. 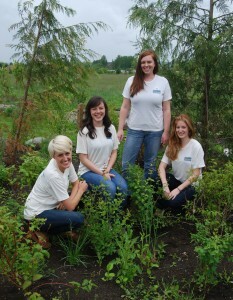 Leave the wild plants in their natural habitat. Hand water or use simple tools like a soaker hose that slowly drips water into the ground. Many plants adapted to dry summers do not need much water a few years after planting. Water only when plants need water and water deeply to encourage deeper root growth. This will result in a healthier and more drought tolerant landscape. Visit our Native Plant Gardening page for more plant ideas.